–Getting to Mexico: Use Google flights, or Skyscanner to find the cheapest airport to fly into (Cancun tends to be pretty cheap). From all the major airports ADO bus stops are near. They connect you to all the major spots to visit in Mexico. ADO buses are safe and inexpensive. This is the best way to travel in Mexico. The buses will take you everywhere for a lot less than a flight. If I have managed to find the bus stops and take buses on my own anyone can. – The ‘Mexico is dangerous for tourists’ myth: The Mexican economy relies on tourism. Therefore, Mexicans are used to having tourists, accustomed to it and generally speaking enjoy having visitors. Hence, there is no need to be scared or fearful. The majority of the Mexican’s I have met have wanted to help out and have been very hospitable. After all, if you were not there many would not have an income. Yes Mexico is corrupt and many poor citizens struggle injustices on a daily basis. However, being a tourist you don’t face any danger. We only hear about the bad things in the media but visiting Mexico yourself you will see its natural beauty as well as be saddened by it’s poverty. – Barter, barter, barter – the price you will be told first is never the real price. If you are buying a top in the market, booking a tour or purchasing some new jewellery you can knock off a fair bit of the money by simply asking. – Public transport – collectivos are very cheap communal taxis. They can squeeze five into a normal taxi but normally they are in the form of old mini buses. They will have the name of where they are going on the front and will shout at you informing you of their destination. I couldn’t completely work out the system but my guess is they get paid the money you give them and not an annual salary. All drivers were very keen to pack as many passengers on as possible. Watch how much the locals pay and give the same amount. Collectivos are not only the cheapest way to get around but provide the best experience. I loved watching the Mexicans as they got on and off at different villages, greeted fellow passengers and some would even chat with you and amongst themselves. Taxis – again bargain with the taxis, you can almost always get a cheaper price. I didn’t take many as I knew they would try and rip me off. When I did I was with others and we got a good price. There are lots of pirate taxis around too. So if alone take an official one (more expensive but safer). Having said this, I am sure one taxi we took was a pirate, it was an old, dilapidated car that was falling apart, it got us to said destination for an extremely cheap price. Hitchhiking – is another option for short distances or long if you have a lot of time. Buses and metro – in Mexico city, the transport is very well linked. The only issue is that it is packed so hard with a back pack. You just have to push your way through. –Getting poorly: If you are ill go to Simi pharmacy (they are a well known, established and reliable chain that appear all over Mexico). You can get a very cheap consultation and all the medicine you need. However, be prepared to practice your Spanish as not all doctors speak English. – Accommodation: Use hostel world (for cheap dorms or private rooms) or booking.com (for slightly nicer places and a bigger range of options). I chose hostels with the best reviews that were still inexpensive. I found that picking hostels with common rooms and included breakfasts was the best in terms of meeting people. The party hostels are louder. So even if you fancy a party I would still chose a quieter hostel and wander in the party hostels later to meet people. –Bring some warm clothes: While staying on Mexicans beautiful beaches is extremely warm, if you stop in any mountain villages, the temperature does drop considerably, so a warm fleece is a good idea for the evenings. –Buy a snorkelling mask: You can buy a good, cheap one on Amazon or any other online website. This way you do not have to hire any in Mexico, which mounts up if you want to look in every cenote, beach or lake you visit. – Don’t drink the tap water: It is recycled water and can make you ill. At the beginning of your trip salads should be avoided as they are washed with tap water. Later on as your body becomes accustomed to the food and Mexican way it might be okay. Some people say drink coke as a medicine for tummy issues. Not sure if the theory is correct. It’s so acidic people claim it to kill any nasties. – What should I do on November 22nd? It’s fine not to have a day to day plan or research too much before you get to Mexico. The best information about what to do is found out from being here, talking to people who have done it before or locals. – Buying silver: Go to Tuxtla near Mexico City for cheap real silver. It should have a 254 number on the back if it’s real. Sadly, I did not have time for Tuxtla but who knows maybe one day I’ll come back. – While no plan is a good plan you need a start point. Look at my route for ideas. 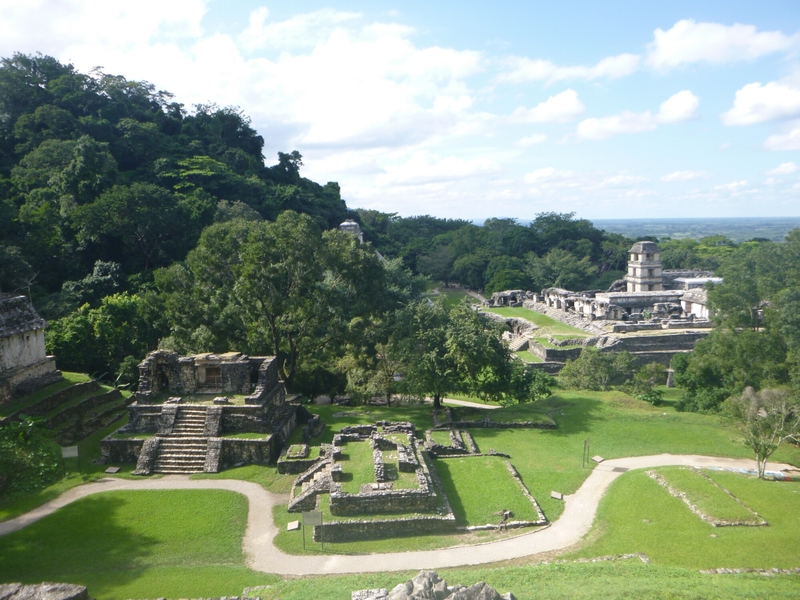 It was as follows: Mexico city, Oaxaca, San Cristóbal, Palenque, Tulum, Bacalar (next I will visit Guatemala) My Mexican route covered, cities, mountains, forests, jungles and beaches. This took just over three weeks. Of course there is lots more to see in Mexico, I have met people who have spend months on end traveling the delights of Mexico. I am happy to have avoided the touristic areas of Cancun,l and playa de Carmen and to have got a glimpse of Mexican life. This route was easily done, fascinating and lots of fun. Lots of people started on Cancun others in Northern Mexico. –Google maps is your new best friend: Surprisingly Google maps can locate you pretty much where ever you are as long as there is satellite service. WiFi is needed to find a route but once found, WiFi is no longer needed to use Google maps. It is so useful if you don’t know where you are while walking around, on a bus or in a taxi. –Try everything you get the chance to and enjoy: The Oaxaca cheese is amazing, the fresh tropical juices (aquas) are incredible. Especially the papaya smoothies. Even the crickets seasoned with lemon and salt from the markets tasted good. -Getting out of Mexico: To exist Mexico by land across the border you need to pay tax. This can be up to $350 pesos. Always when traveling carry some cash in case for unexpected costs. It is useful to have us dollars too as most borders will except these.